In â€ª‎Fergusonâ€¬ and â€ªBaltimoreâ€¬ Our Leaders and Departments were out in full force making a difference. 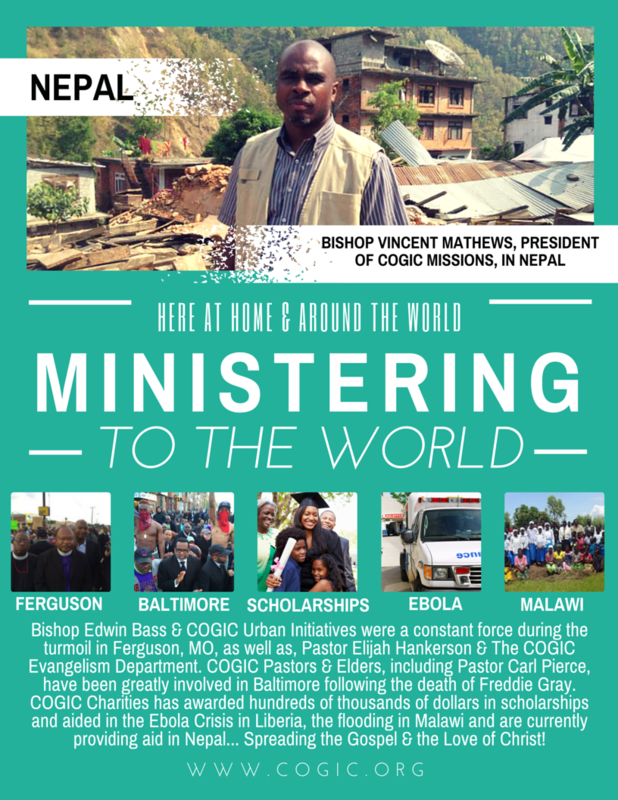 COGIC Charities has given 100's of Thousands of Dollars in Scholarships, as well as, sent an ambulance and supplies to Liberia to help with the Ebola virus, gave $20,000 in flood relief aid in Malawi and have empowered Bishop Vincent Matthews and COGIC World Missions to build 20 houses in â€ªNepalâ€¬ with plans to build 70 more… but we need your help! Click here to support this effort. Let us continue to uphold our leadership of COGIC church in prayer, as they endeavor to do Kingdom business.!!!!! !